One of the greatest statesmen of the twentieth century was Sir Winston Churchill. Churchill said, “If you want to be an exceptional leader, the first person you must learn to lead is yourself.” This was talking about what he called self-leadership. He said that in many ways the war was fairly evenly balanced between the allied powers and the axis powers. Some of the weapons the axis powers had were even beyond what the allies had, but there was more going on within the allied war effort that really made an impact and difference. Improve your leadership effectiveness with this powerful series of audio programs from leading experts. There was more of a positive war effort supporting the campaign. Through music, radio stations, through making sure the mail got through, making certain our troops had food, weapons and medical supplies they needed. Making sure they received the mail from home on a regular basis so they were encouraged and reminded why they were there fighting. It also says that each of us is unique. “…offered the chance to a very special thing, unique to them, and fitted to his or her talents.” There’s something we can bring to the party and nobody can do in exactly our way. It also says that we need to be ready for whatever comes up. 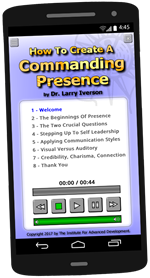 “What a tragedy if that moment finds them unprepared or unqualified for the work which would be their finest hour.” Command Presence is one of those traits that can assist you in being ready for those moments when they come along. To be able to present to people. To get them to make better decisions. To assist people to move forward and take action when they are hesitating or procrastinating. To assist yourself in presenting in such a way that you have the influence to move forward those things that will benefit you, your family and your community. You need to move you forward. For you there will come a time in life, a moment you’re not expecting, and you need to be ready to step-up to that which may be your finest hour.